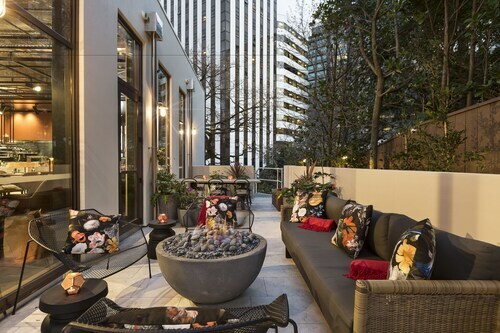 This family-friendly Wellington hotel is located near the airport, within 1 mi (2 km) of St Paul's Cathedral, Old St Paul's, and Carter Observatory. Botanic Gardens and Te Papa (Museum of New Zealand) are also within 1 mi (2 km). Wellington Station is 11 minutes by foot. 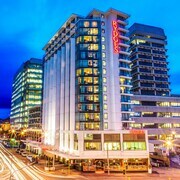 Located in the heart of Wellington, this luxury hotel is steps from Old Government Buildings, Wellington Central Business District, and Wellington Waterfront. Te Papa (Museum of New Zealand) and Westpac Stadium are also within 1 mi (2 km). Wellington Station is only a 3-minute walk. 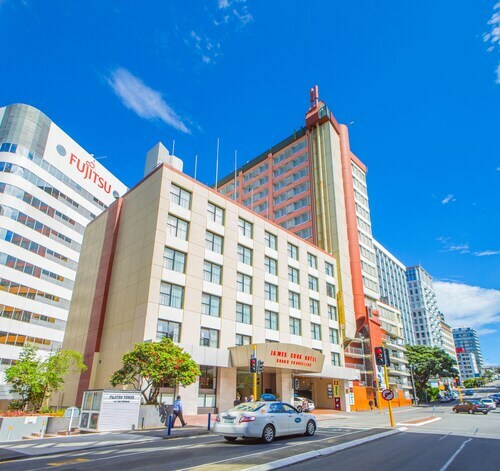 This family-friendly Wellington hotel is located near the airport, within a 10-minute walk of National Library and Wellington Central Business District. Wellington Waterfront and Westpac Stadium are also within 1 mi (2 km). Wellington Station is 10 minutes by foot and Wellington Kaiwharawhara Station is 30 minutes. 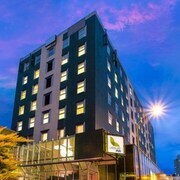 Situated in Wellington, this luxury hotel is steps from Lambton Quay and Wellington Central Business District. Te Papa (Museum of New Zealand) and Wellington Waterfront are also within 15 minutes. Wellington Station is 9 minutes by foot. 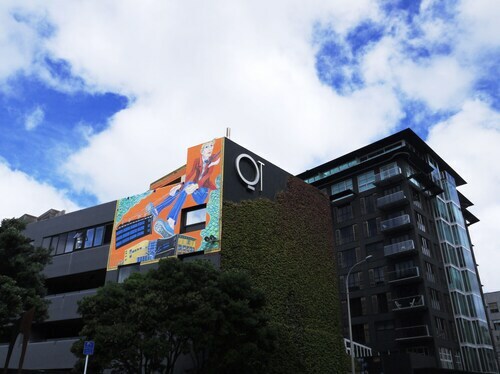 Located in Te Aro, this eco-friendly apartment building is steps from The Opera House, Wellington Central Business District, and Cuba Street Mall. Te Papa (Museum of New Zealand) and Wellington Waterfront are also within 10 minutes. Wellington Station is 18 minutes by foot. 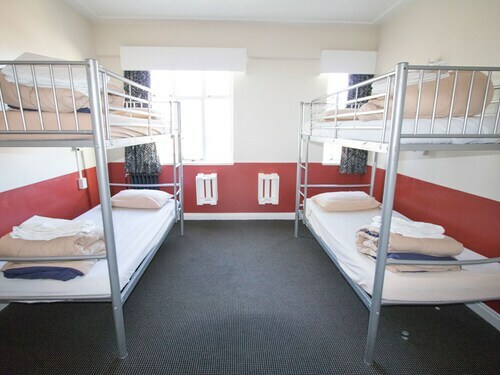 Located in the heart of Wellington, this eco-friendly hostel is within a 5-minute walk of Wellington Central Business District and Wellington Waterfront. Te Papa (Museum of New Zealand) and Westpac Stadium are also within 1 mi (2 km). Wellington Station is only a 1-minute walk. 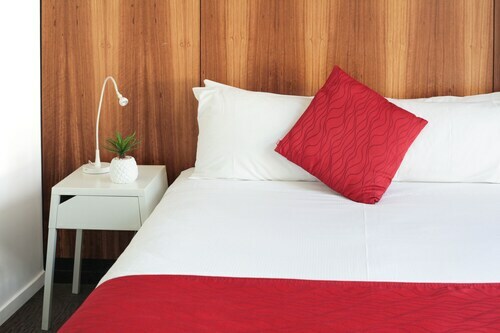 Located in Te Aro, this hotel is within a 10-minute walk of Wellington Central Business District, Te Papa (Museum of New Zealand), and Cuba Street Mall. Wellington Waterfront and Courtenay Place are also within 15 minutes. Wellington Station is 17 minutes by foot. Located in the heart of Wellington, this bed & breakfast is within a 15-minute walk of Wellington Central Business District, Oriental Parade, and Wellington Waterfront. Te Papa (Museum of New Zealand) and Courtenay Place are also within 1 mi (2 km). Situated by the sea, this luxury hotel is within a 10-minute walk of New Zealand Parliament Buildings and St Paul's Cathedral. Old St Paul's and Carter Observatory are also within 1 mi (2 km). Wellington Station is 9 minutes by foot. 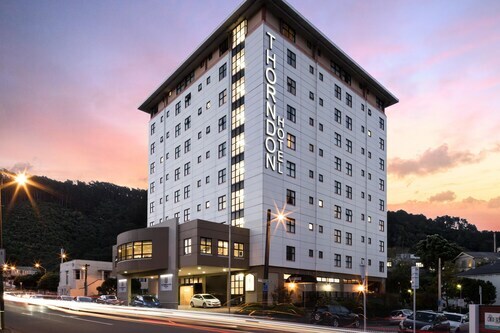 Located in Te Aro, this luxury hotel is steps from Te Papa (Museum of New Zealand), Wellington Central Business District, and Wellington Waterfront. Oriental Parade and Courtenay Place are also within 5 minutes. Wellington Station is 21 minutes by foot. 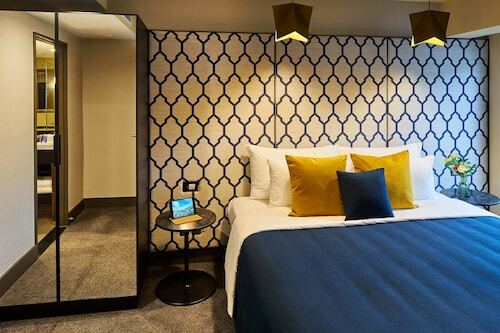 Located in the heart of Wellington, this luxury hotel is steps from Lambton Quay, Wellington Central Business District, and Wellington Waterfront. Te Papa (Museum of New Zealand) and Cuba Street Mall are also within 15 minutes. Wellington Station is 9 minutes by foot. 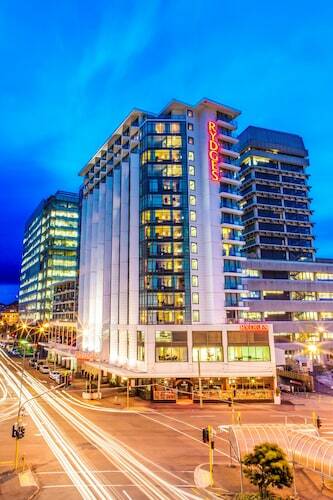 This family-friendly Wellington hotel is located near the airport, just steps from New Zealand Parliament Buildings and Wellington Central Business District. Te Papa (Museum of New Zealand) and Wellington Waterfront are also within 1 mi (2 km). Wellington Station is 9 minutes by foot. Head to New Zealand's capital and stay in one of our Wellington hotels to immerse yourself in heritage, nature and entertainment. Oh, and you'll enjoy great coffee, too. People have flocked to Wellington since long before coffee was a "thing", though. It's believed that the area has been inhabited by indigenous Maori people since about 950AD. It was then settled by Europeans in the mid 19th century and, a couple of decades later, became the nation's capital city. As we mentioned earlier, Wellington is very well known for its coffee. Local roasters and talented baristas have helped to craft the buzzing cafe culture of Wellington, and it seems that every which way you turn, there's a great cafe around the corner. But coffee isn't the only beverage that Wellington is known for. Wellington is often called the "craft beer capital of New Zealand" because many of the local breweries are international award winners. If that wasn't enough, Wellington is also part of the Classic New Zealand Wine Trail. So, once you've had a taste of the beverages of Wellington, why not hit the shops? Cuba Street is known as the "Bohemian side of town" because the street is lined with vintage shops, quirky bars, trendy cafes and street entertainers. If markets are more your thing, the City Market is on every Sunday morning, Hills Street Farmers' Market is on Saturday mornings and, on Fridays, the Wellington Night Market lights up the streets. For something more unusual, check out the Underground Market, which is held every Saturday and features Wellington designers and their wares. Wellington airport is only 10km from the centre of town and it's easy to walk around Downtown – it's only two kilometres from one side to the other. If you want to explore the entire Wellington region, and beyond, purchase a Snapper Card and jump aboard one of the many trains, buses or ferries. So, for a holiday to remember in New Zealand's iconic capital, get yourself on one of our cheap flights to Wellington and book your Wellington accommodation today. How Much is a Hotel Room in Wellington? 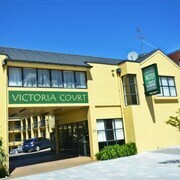 Hotels in Wellington start at NZ$54 per night. Prices and availability subject to change. Additional terms may apply. The best things were the cleanliness, decor, peace & quiet (couldn’t hear a peep from outside), free movies, staff, food in the restaurant, amenities - pretty much everything...the only one problem was the pillows. It would have been better to have a mix of lower pillows as they were all too high to sleep comfortably. 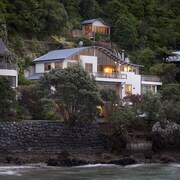 Otherwise amazing place & we’d stay again! The upgrade price for the Club Intercontinental was well worth the money, so many extras for such a small amount. Really felt looked after andvthere wasnt anything they wouldn't do for you.